A versatile pasta shape, spaghetti can be used in entrées, side dishes, cold salads, or broken and used in soups. Toss spaghetti with almost any pasta sauce of varying thickness. Tomato, cream, broth-based and meat sauces, and olive oil tosses all work well with spaghetti. 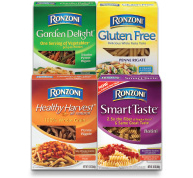 The vegetables in Ronzoni Garden Delight® Spaghetti are blended together to cleverly hide in a beautiful golden pasta to suit any pasta occasion and satisfy even the pickiest eaters.